Missing heirs can be found. 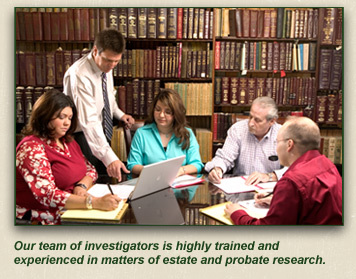 Each year thousands of estates lay unclaimed because the identity or whereabouts of heirs or legatees are unknown. These estates become orphan fortunes, and those legally entitled, however deserving, remain unaware of this potential windfall. The reasons are often understandably regrettable. Families drift apart. Over time relatives lose track of one another. For others no simple clues exist pointing directly to next of kin. Even unrelated legatees, openly named in a decedent's Will, have simply disappeared. Many executors and administrators, even attorneys and others interested in the administration of estates, find they lack the time or expertise to handle the most complicated searches. But the rightful claimants to most orphan fortunes can be found. Expert research, conducted in a systematic and professional manner, even if starting with the slimmest of clues, can end with all the heirs identified beyond legal challenge. Locating missing heirs and legatees to known estates, using the most advanced techniques. Discovering additional heirs or persons of closer degree of relationship than those already claiming. Finding heirs of deceased legatees, or claimants to vested interests. Research done at no cost to the estate. Our fees are negotiated on a contingency basis directly with the heirs we locate. Investigate claims where there is a strong suspicion questioning the accuracy of a previously submitted heirship, suggesting the possibility of other heirs. Securing documented proof sufficient to support an official decree of heirship. All evidence of heirship submitted as numbered entries on easily understood genealogical charts which do not require a talented cryptanalyst to decipher their contents.